Come on, readers – you knew it had to happen at some point! I am a Marvel fan. Of course I would get around to acquiring a Marvel book! Actually, I have several. 🙂 The particular book which I am describing here, Marvel Masterworks #2: The Avengers, is one of my favorites. 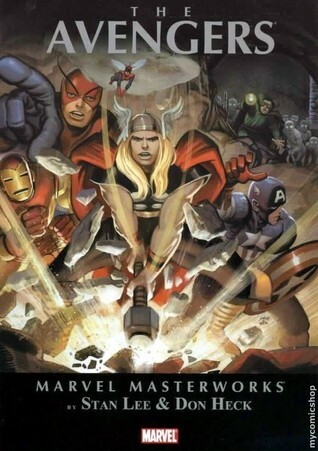 Marvel Masterworks are books which contain a certain number of original comic book stories within them. And in this case when I say original, I mean original! Marvel Masterworks #2: The Avengers contains ten stories – issues 11 through 20 – of the Avengers’ first adventures from 1964-65. WARNING: MAJOR spoilers ahead!!! Read on at your own risk! Inside this volume, true believers, you will find – Captain America! The Invincible Armored Iron Man! The Mighty Thor! Ant-Man and the Wasp! All in their original costumes and settings, with the quirky tools and fantastic adventures that could only be dreamed up by Stan Lee and his friends during the early 1960s! Okay, so the first story is issue eleven of the Avengers, or The Avengers #11, December 1964: “The Mighty Avengers Meet Spider-Man!” A sinister enemy watches the team from the far future. Kang the Conqueror, still smarting from his last defeat at the hands of the Avengers, is determined to have his revenge. But how shall he get it?! Painstakingly, he searches the past for someone – anyone – who would be powerful enough to defeat our heroes. Finding such a person, he makes a robot duplicate and sends it back in time to fight the Avengers who have to deal with the confusing situation of a nefarious duplicate of the good guy they know. Who is the robot a duplicate of, you ask? None other than our friendly neighborhood webslinger, Spider-Man! The next story is “This Hostage Earth!”, and we see on the first page that Ant-Man is greatly agitated. His ants are telling him that someone below ground is trying to destroy the Earth! However, none of the other Avengers take his warning seriously. He is upset because the ants are telling him something is wrong?! How silly! And finds Mole Man has a created a machine which will induce tremors on the Earth’s surface. If the governments above do not heed his demands, Mole Man will make the surface world uninhabitable! Next ish (ish is short for issue, non-comic readers 😉 ), we find our heroes lured into a trap by Count Nefaria. The villainous count is more than a little miffed that the team has been ruining his Maggia operations stateside. As part of the plan, Nefaria frames the Avengers as power-hungry tyrants who want to take control of the world! The team manages to stop him and clear their names but, in the process, Wasp is injured and left on the brink of death! In “Even Avengers Can Die!”, the team races against time to find the one doctor on Earth who can save their only female teammate. They are truly desperate; even the Mighty Thor. This is because even his mortal alter ego, Dr. Don Blake, magnificent physician that he is, does not have the expertise to save her! Then, in issue #15, Baron Zemo and his Masters of Evil – the Enchantress, the Executioner, the Melter, and the Black Knight – spring a trap on the team. Kidnapping Rick Jones, Zemo lures Captain America to his South American base while the rest of the Avengers remain behind to fight the Masters. Then, in “The Old Order Changeth!”, Cap and Rick Jones work their way back to the States. In the meantime, Thor goes back to Asgard for a “Trial of the Gods.” After he leaves, Iron Man, Wasp, and Giant-Man realize they are plum tuckered out. They need a break from Avenging or they will be wrecks by the end of the year! So they call for new heroes to step up and take their places on the team. Many apply but only three are chosen: Hawkeye, a former enemy of Iron Man, is chosen to join the team. Not long after, twins Pietro and Wanda Maximoff are accepted as members of the team. Once enemies of the X-Men, the siblings known as Quicksilver and the Scarlet Witch now seek redemption as part of the Mighty Avengers! In “Four Against The Minotaur!” Cap and his new teammates head out to the desert to find the Hulk in an attempt to build up their strength. Cap learns some of the limits and characteristics of his new recruits along the way. He has little trouble managing the twins but finds Hawkeye mouthy and as hard to control as an unbroken bronco. Despite this, Cap feels Hawkeye will make a splendid Avenger – once his rough edges are smoothed over! Meanwhile, in a separate part of the desert, Bruce Banner appears to die after a fight with the Leader. The next ish shows us the fictional communist country of Sin-Cong, which is run by a ruthless Commissar. In a plot to show how strong the Commissar is, the Communists lure the Avengers to Sin-Cong for a “demonstration.” Trying to get a job with SHIELD, Cap is eager to answer the call – as is the ever-belligerent Hawkeye. Soon the Avengers are fighting the Commissar. But all is not as it seems and when the “weakest” Avenger, Wanda Maximoff, goes up against him, the Commissar gets more than he bargained for! The last two issues in the book introduce us to the Swordsman, Hawkeye’s former mentor. Arriving one day at Tony Stark’s mansion – which is on loan to the Avengers – the Swordsman is greeted, ah, “warmly” by the Maximoff twins. The man escapes after a furious Cap reveals the Swordsman is wanted in a number of countries for theft! Sadly, the note makes its way to the Swordsman, who uses it to trap Steve. Things get hairy when Cap’s three young friends track the two down, but the New Avengers are equal to the task and the Swordsman’s plot is foiled. Then the Mandarin takes a hand in the matter, and manages to get the thief accepted by the Avengers through some masterful trickery. But the Swordsman is only there to plant a bomb in their headquarters, to be detonated remotely by the Mandarin when Iron Man (the Mandarin’s arch-enemy) returns to the team! However, the Mandarin eventually decides he is tired of waiting and tells the Swordsman he will be activating the bomb ahead of schedule. The scoundrel has to make a choice: leave the Avengers to die, or save them – even if doing so incurs the wrath of the deadly Mandarin! I would say that issues 11, 13, 14, 15, 17, 18, and 20 are my favorite stories in this book. All the comics in this book are, to those of us born in this late age, rather kooky and silly at first, second, and even third glance. But the modern stories in Marvel Comics lack the cheerfulness, flair, and optimism which characterize the company’s older stories in copious, startling amounts. The old stories are positive, chipper, and see the future as a bright road leading to a better tomorrow. The new stories – not so much. I really, REALLY miss those kinds of statements – not only in our modern comics, but in all our current stories. This is what makes “Even Avengers Can Die!” one of my favorite original comics in the book. Readers, if you someday decide it is worth a look, I hope you enjoy this volume of original comics as much as I do. And if you are totally uninterested not only in this book but in Marvel Comics in general, well, I hope you found at least a little happiness and sunlight in this post. That will satisfy me as much as anything else would. This entry was posted in Book Reviews, Marvel Comics' Characters and Stories and tagged 1960s, Ant-Man/Hank Pym, Baron Zemo, Book Reviews, books, Captain America/Steve Rogers, comic books, Count Nefaria, Don Heck, Donald Blake, Giant-Man/Hank Pym, Hawkeye, Hawkeye/Clint Barton, Hulk/Bruce Banner, HYDRA, Iron Man/Tony Stark, Kang the Conqueror, Marvel, Marvel Comics, Marvel Comics' Characters and Stories, Mole Man, Nick Fury, Peter Parker/Spider-Man, prayer, Quicksilver/Pietro Maximoff, Rick Jones, Scarlet Witch/Wanda Maximoff, SHIELD, Spider-Man, Stan Lee, the Mandarin, The Swordsman, The Wasp, Thor, Thor Odinson, Wasp/Janet Van Dyne, X-Men on April 29, 2016 by The Mithril Guardian.